Our southern oceans boast a prolific number of whales during the annual migration period. We are privileged to be able to observe them in brief glimpses as they navigate the length of our Southern African coastline. Sadly, from time to time, whales get stranded alive or wash up dead upon our shores. Such is the nature of Mother Nature. When events such as these occur, there is always a sadness and a collective outpouring of emotion from the public, but while no one likes to see one of these sentient creatures end up this way, it does afford people the chance to observe them up close and thus serves as an ideal learning platform for those interested in the marine environment. The study of marine wildlife across their deep and vast ocean realm is exceptionally challenging, and therefore whale strandings can provide scientists the opportunity to conduct valuable research. Of course many whales die across the world’s oceans each year, but most carcasses never reach the shore and are scavenged and decompose enough to sink to the ocean bottom, forming the basis of a unique ecosystem referred to as ‘whale fall’. Whale fall is the carcass of a cetacean that has fallen into the abyssal zone (i.e. deeper than 1,000m) on the ocean floor. They create complex localized ecosystems which can supply nourishment to deep-sea organisms, sometimes for decades. There are those occasion however, when a dead whale is carried to shore by the tide. Live strandings of whales are however very distressing to observe. They can be attributed to both natural and environmental factors: weakness due to old age or infection, injury from an attack by a rival male or a predator, rough weather, difficulty giving birth, hunting too close to shore, or even navigational errors. Unfortunately, many live strandings often result in death in the absence of human intervention, and, very often human intervention is not possible, due to the sheer size of a whale, which makes it a serious logistical challenge for those seeking to assist. Over the past few months, two whales came to their final resting place upon the shores of the Swartvlei beach in Sedgefield. The first whale to become stranded was a juvenile female humpback whale. This is one of the migratory baleen whale species that we are fortunate enough to see each year, and perhaps one of the most loved among whale watchers. They are renowned for their complex whale songs, and have been dubbed the ‘angels of the sea’ because of their unusually long pectoral fins that appear like wings when they launch themselves out the water during breaching. Every year they delight us with their acrobatic above-surface displays. 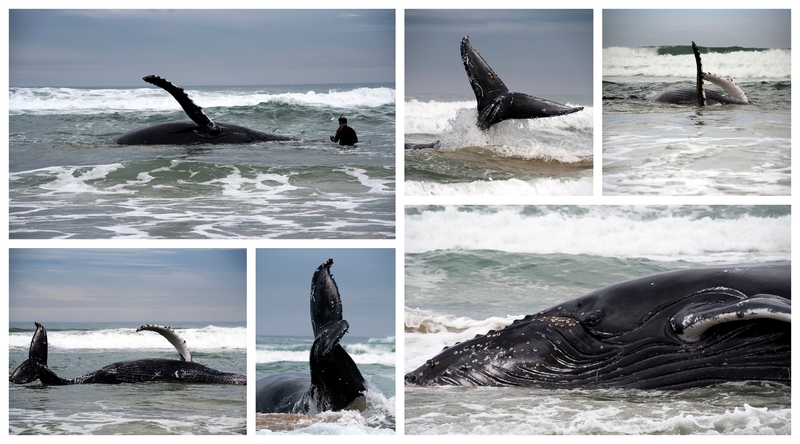 A heart wrenching scene unfolded as the young whale struggled and thrashed for hours on the beach. Unable to assist in any way, onlookers stood by, desperately hoping the whale would be able to swim back out to sea on the high tide. Weak and clearly unwell, this, sadly, did not happen. What I witnessed however, was a deep connection between an ocean loving man and a dying whale in its last moments, standing right beside her and looking into her eyes as she sang her last song. She knew she wasn’t alone – and to me that was something quite extraordinary. It made it a little easier for me to accept. 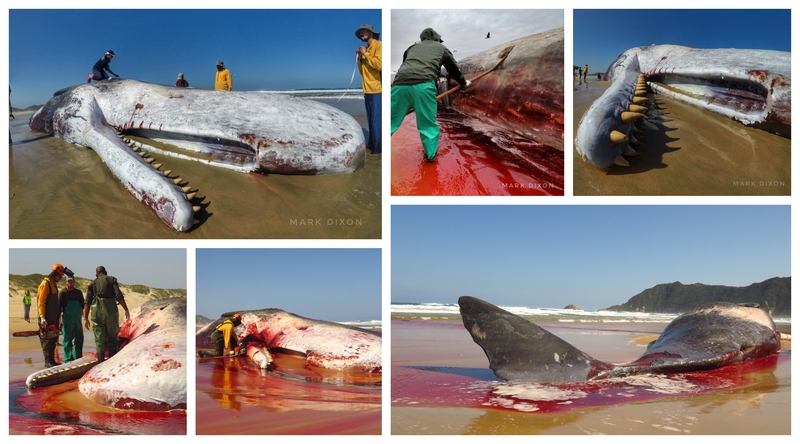 The more recent stranding was that of a 16,3m male sperm whale that had beached posthumously. Interestingly, it beached within 100m of the humpback whale a month earlier, obviously carried by the same prevailing currents. It was ascertained that the whale had been dead several days. Sperm whales are the largest of the toothed whales and the largest toothed predator. They are almost never seen in these parts. They are deep ocean dwellers that feed at depths of more than 1000m metres down, diving on single breath for up to 90 minutes before returning to the surface for air. It boasts the largest brain on Earth, more than five times heavier than a human brain. These popular cetaceans are very vocal and emit a series of “clangs” that are used both for communication and echolocation. Again on the scene was Mark Dixon, along with Danielle Conry and Frikkie van der Vyver from the Plett Stranding Network and Wayne Meyer from Cape Nature. Sperm whale strandings are quite rare, this being only the fourth in the last 8 years and also the most intact specimen and therefore this event afforded these scientists an opportunity for research and sampling. Over the course of the next few days and throughout the rather complex sampling and dissection of the carcass, Mark provided curious community members with an extremely educational narrative of the entire event via Facebook and other online platforms. What caused the death of the Sperm Whale is not yet conclusive, but injury cause by mating conflict, illness or nutritional deficiency are all possibilities. So while the death of any sentient mammal is tragic and sad to witness, these events provide all of us with a little more insight and understanding about the wonderful and complex web of marine life.